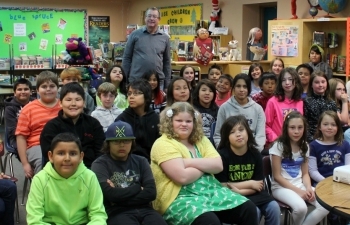 Award winning author, Eric Walters, poses with grade 4, 5, & 6 classes after his presentation on Wednesday Apri 29th at Evergreen School. Mr. Walters has over 80 books published and several more due for release within the coming year. with a social work background and many years of teaching in grades 1 - 8, Eric says his favorite grades to teach are 4, 5 & 6. He was very impressed with the staff and especially the behaviour of Evergreen's Students. Nicholas from Ms. Cottrell's class, said about the presentation, "It was AWESOME". Mr. Walter's message to the students and staff is to foster the love of reading and how having a great role model can make all the difference. Having traveled the world over, Eric brings a message of unity, equality, acceptance and adventure. In 2007 during a visit to Kenya, Eric discovered the staggering rate of orphaned street children and founded the Creation of Hope which currently supports more than 400 oprhaned children in the Mbooni district in rural Kenya.